Description: You are looking at the English version of The Bank of Canada May 6th 1935 $25 bill. King George V and Queen Mary are featured on the front of each twenty-five dollar bank note from 1935. 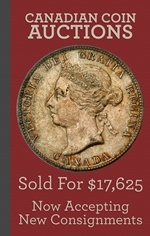 The Canadian Bank Note Company, Limited printed this denomination for The Bank of Canada. Varieties: There are no varieties to 6 Mai 1935 $25 bills from The Bank of Canada. J.A.C. Osborne signs as the Deputy Governor and G.F. Towers as the Governor. 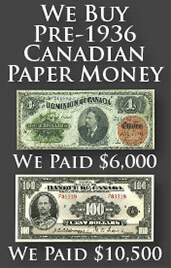 We buy all May 6th 1935 $25 bills from Canada. Values are based purely on condition and generally range from $1,000 to $8,000. If you would like our offer, then please send us pictures of your bank note. We will grade the paper money and respond back quickly with our buy and sell price. You might be surprised at how much money some high grade 1935 twenty-five dollar bills are worth.